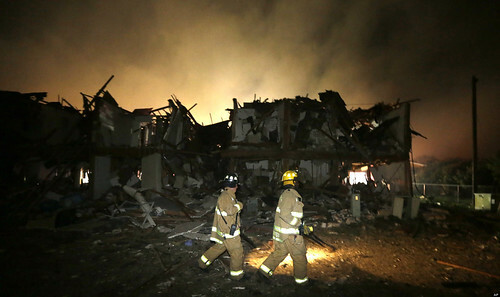 At around 8:00 Wednesday the fertilizer factory in West, TX exploded. At current the number is around 200 injured and 5 - 15 killed. A nursing home, the Junior High, and many other buildings are badly damaged. More info here and here. Before I go to how to help...here's some good articles for us as parents. You may be wondering how to talk with your kids about this, and this article at World Vision offers some good tips. If your kids actually experienced the disaster, this article at CNN may help.. I'd like to add to that that I think it helps to talk about the people who help (firemen, police, doctors and nurses, and just regular people who volunteer or give). I think it helps kids to know that when bad things happen, there will be someone there. And if you do talk about that, your kids might wonder what they can do...and this article talks about that. APRIL 27-28, WACO: West First Concert - Over a dozen bands have offered to play at a two day concert to West victims at The Melody Ranch. Tickets are $10 for adults and $1 for kids 10 and under. (Show will be kid-friendly). Times are Saturday, 5 pm - 1 am, and Sunday, 2 pm to 10 pm. APRIL 27, WACO: Harley-Davidson of Waco will be hosting a Crawfish Boil Relief Fundraiser on Saturday April 27th starting at 10:00am. There will be a live band, blood drive, adult beverages provided by Elite Circle Grille, and of course crawfish with all the fixings! ALL proceeds from this event will go to benefit the families that have been affected by this horrible disaster. If you have any questions or would like to help, please call 254-753-0393 and ask for Meredith, or email Meredith.dupree@hdwaco.com. APRIL 28, AUSTIN: Willie Nelson is donating the proceeds from his upcoming 80th Birthday Concert in Austin to West Families. April 28th. There's several places selling tickets so a google search is your best bet. Over 300 people that lined up to give blood yesterday! WOW! There are also blood drives going on, listed below (warning, they may be crowded). Both the Red Cross and Carter BloodCare asked potential donors to make appointments to give blood in upcoming days and weeks, at the Red Cross Website ( www.redcrossblood.org )or by calling 1-800-733-2767, or contact Carter BloodCare through www.carterbloodcare.org. Also, various upcoming drives can be found HERE. If you plan to give blood, make sure you are properly hydrated--ie, drink an extra glass or two before bed (orange juice is good too) and before heading to the donation site tomorrow or the next day. People sometimes are not able to donate because of your iron levels or low hydration. More tips for a successful donation here. Aggieland Outfitters has also set up a number to text for information about volunteering. By texting "HELPWEST" to 99000, Aggieland Outfitters will provide information as it becomes available. Samaritan's Purse is organizing volunteers here. Cash donations are most needed now. Donations to the West Relief Fund can be made through Baylor online here. GENCO Federal Credit Union has established an emergency fund for the Red Cross for use in West relief. Donations may be made at GENCO branch offices in Lacy Lakeview/Bellmead, Waco, Woodway and Lorena. Call 1-800-922-6428 for information. Point West Bank in West has a fund established for emergency relief. The Knights of Columbus also have a Fund for West Disaster Relief with information at www.kofc.org/Texas. The Waco Foundation will receive donations for a West, Texas Disaster Relief Efforts Fund with information on how to give on its website, www.wacofoundation.org. Call Melissa Miller, director of communications and donor services, at 254-754-3404. You can donate to the Heart of Texas Red Cross here. The Heart of Texas Red Cross also has an Ebay Giving Works page, so if you have items you would like to sell on ebay to raise funds (or shop items other people have given) you can so that there. You can give money at the check out counter of any Heart of Texas Good Will Store. Texas Partners Federal Credit Union is accepting donations to assist the community of West through April 30. Cash donations are accepted and the credit union is selling “World's Finest Chocolate” to benefit relief efforts. Donations will be accepted at all branch locations: 2445 N. Main Street in Belton, 809 S. Main Street in Copperas Cove, 1011 Wales Drive in Killeen, and 6935 W. Adams Avenue in Temple. To mail a donation: Attn: West, TX Relief Fund, 1011 Wales Drive, Killeen, Texas 76549. Questions may be directed to Shelley Carlson at (254) 526-3081. Cash Donations can be made at the grocery counter of any HEB grocery store. I am not listing any places to bring in-kind gifts right now because the town of West has asked that people hold off on these for now as they have what they need. However (and this isn't based on anything I've read, just a hunch of mine), I'm guessing that eventually they will probably need building supplies for the repair efforts. I would hold onto those now if you have them to donate...but contact someone to let them know you have these and would be willing to donate them. I wish I knew who to direct you to to ask but I'm not sure who the right person/organization would be. If you would like to offer someone from West a place to stay, you can do so here. Unfortunately, West Texas has caught the eye of Westboro Baptist Church and they will be tastelessly coming to picket the memorial at Baylor Thursday. Volunteers who feel they can keep their composure and NOT ENGAGE these protesters in any ways will be forming a "human wall" around the memorial so that these protesters will not disturb the mourners attending the service. You can find out more about this here. Please everyone pray for peace and safety...and for God to give us the grace to know how to handle ourselves in this horrible situation. "Emotions and energy are high...and I hope our community will continue to keep our composure and grace. These people thrive on hate. How wonderful would it be to render them powerless and impotent by our peacefulness and solidarity in honoring our dead and comforting their families. Instead of hate, let us demonstrate and show WE are Christian by our love....."
Let People Know You are Safe and Well here, and find others. Help Locate Missing Pets Here. All Heart of Texas Good Will Shops are offering 20% off to West Residents - just bring in an ID showing that you live in West. Other Resources such as housing listed at WacoTrib and on this blog.